Lloret de Mar is one of the biggest and liveliest resorts on the Costa Brava. This is the Costa Brava’s answer to tourist resorts such Benidorm on the Costa Blanca and Torremolinos on the Costa del Sol. Lloret de Mar has an abundance of clubs, bars and discotheques open pretty much 24 hours – well almost! Many families also enjoy this family friendly tourist resort due to the fabulous beaches and plentiful facilities. Lloret de Mar boasts over four miles of coastline – not just sandy beaches, there also some nice coves in which you can generally escape the crowds on the main beaches. Situated on the coast between the major resorts of Tossa del Mar and Blanes. The nearest major cities are Barcelona and Girona. Below we have an interactive guide and map of Lloret de Mar for visitors and tourists visiting the resort of Lloret de Mar on the Costa Brava coast of Spain. This free Google map of Lloret de Mar can be used in many ways: as a streetmap of Lloret de Mar, as a map of Lloret de Mar hotels, as an Lloret de Mar apartment map, as a way of getting driving directions to Lloret de Mar or as a map showing the main tourist attractions and sights in Lloret de Mar. Where is Lloret de Mar located in Spain? What is the nearest airport to Lloret de Mar? Where can I find driving directions to Lloret de Mar? Where can I find a free streetmap of Lloret de Mar? Where can I get a hotel map of Lloret de Mar? Lloret de Mar is a large beach resort popular with package-holiday makers from northern Europe such as the United Kingdom or Germany. Lloret is a very lively, busy resort which has hundreds of bars, nightclubs and restaurants. Many visitors come especially for the Lloret de Mar nightlife including many hen parties, hen weekends as well as stag parties and stag-dos. Lloret de Mar is a two hour plane ride from most U.K. airports. If you would like to go on holiday to Lloret de Mar then you can choose either Girona Airport or Barcelona Airport as your flight destinations. Both of these airports are serviced by quite a few budget airlines including Ryan Air and Easyjet. Once at the airports you can easily hire a car from Girona airport or get an airport transfer to Lloret de Mar. Note on the map how close Lloret de Mar is to the other major tourist resorts of Tossa del Mar and Blanes on the Costa Brava. Barcelona – 76 km/47 miles. 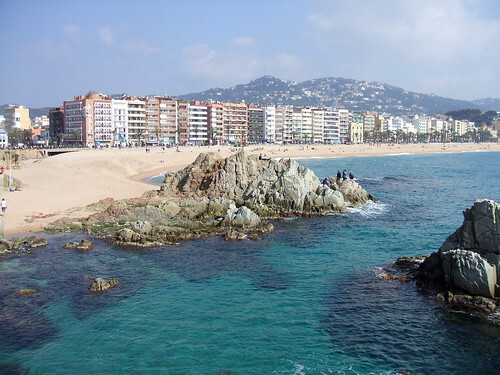 Blanes – 7 km/4 miles. Caldes de Malavella – 28 km/17 miles. Escala – 82 km/51 miles. Figueres – 80 km/50 miles. Girona – 42 km/26 miles. Mataro – 43 km/27 miles. Palamos – 56 km/35 miles. Rosamar – 25 km/16 miles. Sant Feliu de Guixols – 32 km/20 miles. Santa Cristina d’Aro – 38 km/24 miles. Tossa de Mar – 11 km/7 miles. Girona Airport is the nearest airport to Lloret de Mar and is thirty kilometres away with a travel time of approximately thirty five minutes. Here are various Lloret de Mar airport transfer options. British Midlands offers daily flights from Birmingham to Girona and Ryan Air has services from Blackpool, Birmingham, Bournemouth, Bristol, Doncaster, Dublin, Durham, Liverpool, London Luton, London Stansted, Manchester, Newcastle, Newquay and Shannon. Water World close to Lloret de Mar is of course a water park with slides and is great fun for the family. Waterworld Lloret opens from about the 16th of May of each year and closes again on or around the 18th of September. The Waterworld park is generally open from ten in the morning until either six or seven in the evening each day. It is proven that Lloret de Mar dates back to the 3rd century BC so needless to say it is also rich in history – not that many people visit Lloret de Mar for that! Still if you need a break from the sun and sand there are options. There is the Maritime Museum just off the seafront promenade. The Castell (castle) de San Joan dates back to the 11th century. It has been attacked many times. Now it has been restored and serves as a heritage centre. The cliff top gardens of Santa Clotilde are simply stunning. They were designed by the architect Nicolau Rubio in the 1900’s. Lloret de Mar has plenty of golf courses nearby including Santa Cristina de Aro golf course and Club de Golf Angel de Lloret. Mass tourism really hit Lloret de Mar in the 1950’s and 1960’s with the advent of the package holiday. Access is easy due to the close proximity of Barcelona airport. 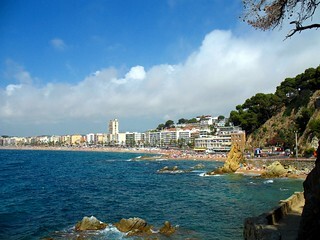 Of course the big tourist attraction of Lloret de Mar are the beaches. The town is built next to the main beach known as the Playa de Lloret. This is a mile-long beach lined with a promenade as you would expect it has plenty of shops, bars and restaurants. Also popular is the beach of Playa Santa Christina. ou can enjoy sailing, scuba diving, windsurfing, parasailing, jet skiing and water skiing. South of the main beach you have the quieter and certainly more scenic Playa de Fenals, backed by green pine trees this makes a lovely location for a picnic. Lloret de Mar is famous – or should that be infamous? – for it’s nightlife. People come to Lloret to have fun and party and there are all sorts of nightclubs, discos, bars, cafes and restaurants. Some popular Lloret de Mar bars are: Gerrys Bar, 7 Seas Pub, Funky Monkey, Buzzby’s, Rabbies Bar, Sportsman Pub, Route 66, Navy Pub, Rob Roy, Bravehearts and Bar Cala Banys. Lloret de Mar is renowned as a popular destination for hen weekends, hen parties, stag weekends and stag-dos. Our nightlife in Lloret de Mar page has more information. Of course tourists don’t come to Lloret de Mar to experience the traditional Spanish cuisine. It is there with some fine Spanish restaurants but of course there are lots of English restaurants, Indian curry houses, Chinese restaurants and all the major brand-name fast-food places. Try the Can Sabata restaurant who offer a good-value Menu del Dia for €9. This is for a 3 course lunch with bread and wine included. Lloret de Mar is a great place to search for jobs especially if you are under the age of 30 because the nightclubs, bars and pubs are always needing extra staff for the summer season in Lloret which is full of young partymakers getting drunk. We have a jobs in Spain section with useful advice on where to start. Below we have a short video of the sights and attractions in Lloret de Mar. 1. Take a day out from Lloret to visit the scenic city of Girona. 3. For another big beach resort close to Lloret de Mar, consider a day trip to either Blanes or Tossa de Mar. 4. In just two hours you can drive into the Pyrenees mountains and go sking in Spain. 5. A day trip to Barcelona from Lloret de Mar is an essential day out. The local tourist office offers a service where they can help you find accommodation in Lloret de Mar. There are hotels, apartments, pensions, apart-hotels, hostels and camping sites. A suggestion for a hotel is the Lloret de Mar Oasis Hotel (Oasis Park Hotel). Just four hundred metres from the nearest beach and only eight hundred metres from the resort centre. Offering 428 rooms the Lloret de Mar Oasis is a 4 star establishment offering the highest quality services in a relaxed atmosphere. The hotel has a bar area, restaurant, two swimming pools (one childrens), sauna, Jacuzzi, gym, games room, and offers evening entertainment. The Lloret de Mar Oasis can be easily reached from Girona airport (25 km) and Barcelona airport (75km). The hotel is located in Calle Pere Codina I Mont, Lloret de Mar. The tourist centre office in Lloret de Mar can help you will local information such as maps, guides, brochures, help with accommodation and they can answer any questions you have about dates for festivals, fiestas, weather information, transport and airport transfers to Lloret de Mar. Address: Terminal de Autobuses, Avenida Vila De Blanes s/n, 17310, Lloret de Mar (Girona). Address: Avenida de las Alegrías 3, 17310, Lloret de Mar (Girona). Address: Paseo Camprodón i Arrieta 1-2, 17310, Lloret de Mar (Girona). Official Website: The official website for Lloret de Mar. Page Summary – This page contains unique content about the beach resort of Lloret de Mar, a popular and very large tourist destination on the Costa Brava coast of Spain.